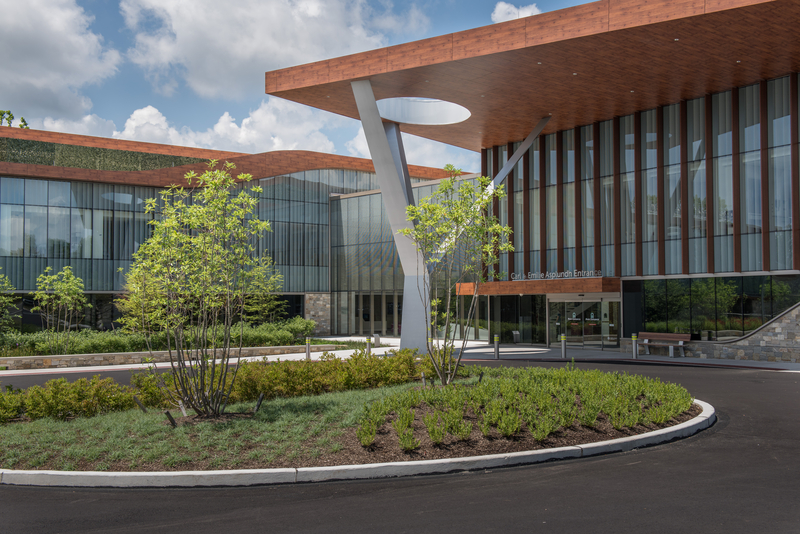 The recently opened Asplundh Cancer Pavilion's 86,000-square-foot outpatient center in the suburbs of Philadelphia combines state-of-the-art cancer-fighting science with a serene healing environment. Its biophilic design by EwingCole includes an exterior architectural aluminum system finished by Linetec to resemble the look and texture of natural wood. 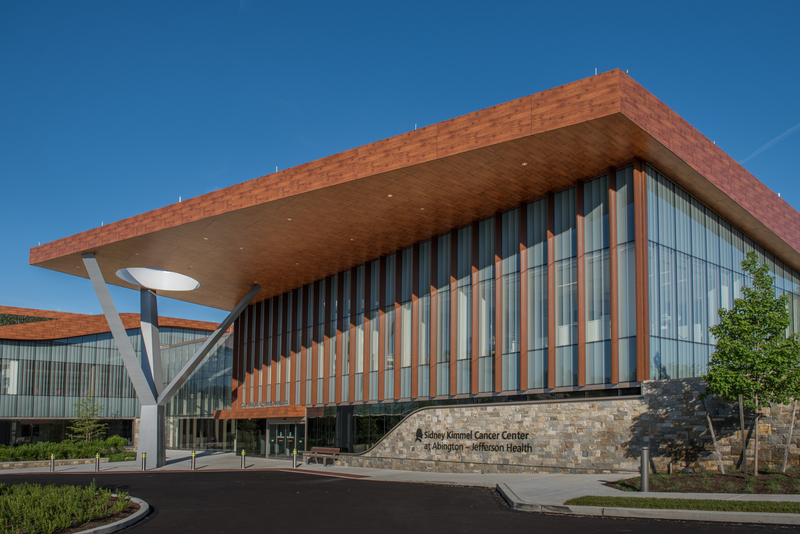 "Our design team did an incredible job bringing the outdoors into the Pavilion with abundant natural light, birch and moss design elements, and views of the surrounding greenery," said Peg O'Grady, Asplundh Cancer Pavilion's administrative director, oncology at Abington - Jefferson Health. "Research shows that the environment has an effect on the burden of disease and healing times, so we were sure to make each choice thoughtfully." The design team interviewed patients and their family members and engaged the Patient and Family Advisory Council as a sounding board. Local stone, indigenous plants and local contractors were used. Demonstrating its environmentally responsible design and construction, the project's LEED® certification is in progress with the U.S. Green Building Council. Each year some 2,000 new cancer patients select Abington Hospital for diagnosis, treatment and ongoing care – making its program one of the busiest cancer centers in the region. "A cancer diagnosis is something that no one should ever face alone," said Steven J. Cohen, M.D., Medical Director, Asplundh Cancer Pavilion, and Chief of Medical Oncology and Hematology at Abington - Jefferson Health. 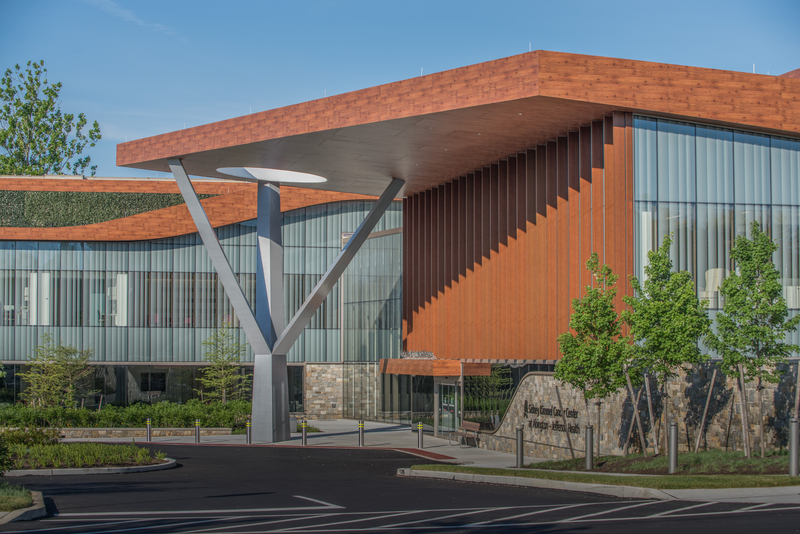 "Under one roof, our patients and their families will find every available outpatient resource – from the latest clinical trials to our Image Recovery Center – all paired with excellence in multidisciplinary clinical care." Unlike real wood, the finished aluminum is termite and insect proof, UV and corrosion resistant, and fire retardant. The sun shades and accents maintain their intended appearance in all seasons, and do not swell, rot and warp. Linetec's wood grain finishes meet the American Architectural Manufacturers Association's stringent AAMA 2604 test standards for ruggedness, chemical and weather resistance. "Offering long-term durability, the finished aluminum components also are less costly than real wood, providing superior performance and retaining the natural aesthetic," said Linetec's Tammy Schroeder, LEED Green Associate. "Linetec performed great on this project and it shows," praised Bob Kennedy of glazing contractor R.A. Kennedy & Sons, Inc.
Pennsylvania-based R.A. Kennedy & Sons, Inc. performed all of the exterior glazing, which included two- and four-sided structural glazed curtainwall, traditional curtainwall, aluminum entrances, and custom aluminum trims. Kawneer's aluminum framing was used for center's four-sided, structural glazed curtainwall. In this four-sided cassette system, glass and subframe were fabricated together by R.A. Kennedy and then installed on site into the curtainwall's carrier frames. The two-sided system used a conventional structural glazing process. The center was funded in part by a lead gift made by the children of the late Carl and Emilie Asplundh, who honored their parents by naming the building. 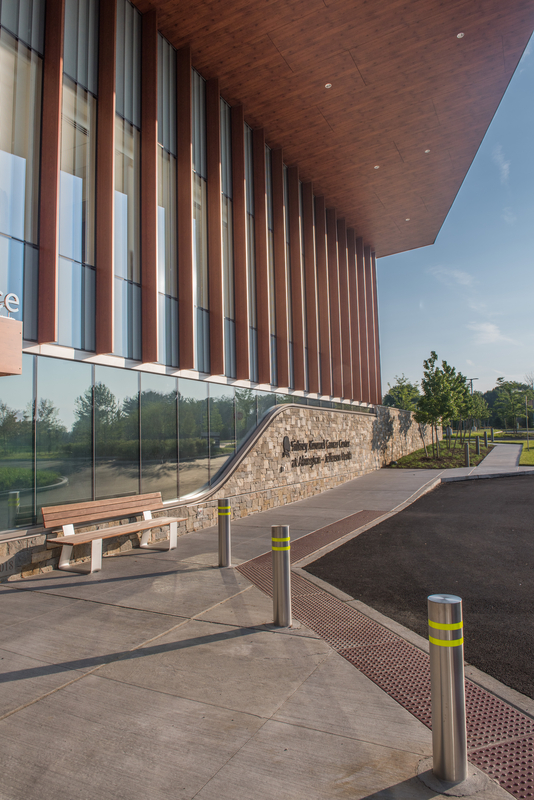 "Understanding the need for this new facility and expanded programming, our community has supported this effort by making more than 5,000 contributions to our Reimagine Cancer Care Campaign," said Meg McGoldrick, president, Abington - Jefferson Health. "The Asplundh Cancer Pavilion represents our commitment to meeting the greatest health care needs of our community." Linetec is a member of the Aluminum Anodizers Council (AAC), the American Architectural Manufacturers Association (AAMA), the American Institute of Architects (AIA), the Association of Licensed Architects (ALA), the National Glass Association/Glass Association of North America (GANA), the U.S. Green Building Council (USGBC) and the Window and Door Manufacturers Association (WDMA).